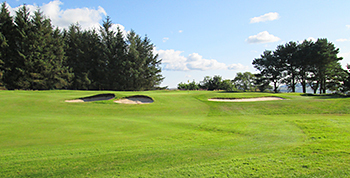 Hawick Golf Club was established in 1877 and boasted a membership of thirteen in its first season. The course on Vertish Hill, just south of Hawick, originally consisted of eleven holes, though it was extended by one hole two years later. It wasn’t until 1894 that a full 18-hole layout came into being. The current length of the course is 5,933 yards, consisting of fourteen par fours and four par threes. There are some wonderful views to be had from the elevated position of the course and this becomes more evident as the routing rises from the 4th tee on the hole called “Well” then continues around the natural contours of Vertish Hill. The difficult, 445-yard, par four, 6th hole, named “Hunter” is normally played against the prevailing wind and par is a very good score here. The course then levels out and more or less follows the same contour of the hill for a few holes. The spectacular views continue until the 390-yard, par four, 11th hole, appropriately called “High” which climbs further up the hill. When the 437-yard, par four, 15th hole, “Gallery” is played, the highest point on the course has been reached and this time the Borders scenery is even more dramatic than before! From here, the only way is down, with two short par fours “Pit” and “Burgess” played before arriving at the 210-yard, par three, final hole. From an elevated tee position on the 18th, the tee shot has to find a tricky green, located close to the road at the back. Nick Faldo, Colin Montgomerie and Tony Jacklin are all honorary members at Hawick and Faldo holds the professional course record of 64. Hawick is a tough little track, with a standard scratch score of 69, one over the par for the course. This is largely due to the long, punishing par fours that are played uphill (and into the wind normally) at holes 6, 7 and 11. For some golfers, I’m sure these three brutes will somewhat spoil their round as it felt like a real slog playing them yesterday in sunny, windless conditions – heaven knows what it would be like into the teeth of a stiff breeze.. The problem with setting out a course around and over a rather steep hill is that, in order to enjoy the dramatic plunging downhill holes, you have to work your way up there - unless, like Tecina in La Gomera, you take transportation to the top then slowly zigzag your way back down to the clubhouse! I came across two really quirky features that I’d never seen before on a course. The first of these was a 150-yard long wooden board stop on the left side of the 5th fairway to prevent tee shots running off the severe right to left slope as the hole runs along the side of the hill. The other eccentric thing I came across was a foot high grass “snooker table cushion” built around the right side of the 14th green, to stop balls that run in from the left to right sloping fairway from falling down the steep incline. There’s lots of other more conventional old-fashioned design traits to be found here, such as crossing fairways (the downhill 15th crosses first the 6th and then the 11th), interesting short par fours (like the left doglegged 12th with its blind approach to a sunken green and the plummeting 16th which is named after Bill McLaren, the former BBC rugby commentator), and lots of lie of the land putting surfaces. To be honest, I’m a little surprised that Hawick made the current Borders Top 5 chart ahead of both Hirsel and Torwoodlee and I’d be interested to find out if others who have played all three courses agree with that assertion.